Emerson, A. E. 1965. A review of the Mastotermitidae (Isoptera), including a new fossil genus from Brazil. American Museum Novitates 2236:1-46. Goodisman, M. A. D. and R. H. Crozier. 2002. Population and colony genetic structure of the primitive termite Mastotermes darwiniensis. Evolution 56(1):70-83. Jarzembowski, E. A. 1980. Fossil insects from the Bembridge Marls, Palaeogene of the Isle of Wight, southern England. Bulletin of the British Museum (Natural History) Geology 33(4):238-293. Klass, K. D. 2000. The male abdomen of the relic termite Mastotermes darwiniensis (Insecta: Isoptera: Mastotermitidae). Zoologischer Anzeiger 239(3-4):231-262. Krishna, K. and A. E. Emerson. 1983. A new fossil species of termite from Mexican amber, Mastotermes electromexicus (Isoptera: Mastotermitidae). American Museum Novitates 2767:1-8. Krishna, K. and D. Grimaldi. 1991. A new fossil species from Dominican amber of the living Australian termite genus Mastotermes (Isoptera: Mastotermitidae). American Museum Novitates 3021:1-10. Nalepa, C. A. and M. Lenz. 2000. 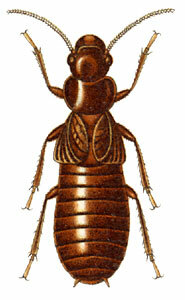 The ootheca of Mastotermes darwiniensis Froggatt (Isoptera: Mastotermitidae): homology with cockroach oothecae. Proceedings of the Royal Society of London Series B 267(1454):1809-1813. Nel, A. and A. Arillo. 1995. Revision de Mastotermes haidingeri (Heer, 1849). Description de deux nouveaux Mastotermes de l'Oligocene de France et d'Espagne (Isoptera, Mastotermitidae). Bulletin de la Société Entomologique de France 100(1):67-74. Sacchi, L., C. A. Nalepa, M. Lenz, C. Bandi, S. Corona, A. Grigolo, and E. Bigliardi. 2000. Transovarial transmission of symbiotic bacteria in Mastotermes darwiniensis (Isoptera: Mastotermitidae): Ultrastructural aspects and phylogenetic implications. Annals of the Entomological Society of America 93(6):1308-1313. Wier, A., M. Dolan, D. Grimaldi, R. Guerrero, J. Wagensberg,and L. Margulis. 2002. Spirochete and protist symbionts of a termite (Mastotermes electrodominicus) in Miocene amber. Proceedings of the National Academy of Sciences (USA) 99(3):1410-1413. AMBER: Window to the Past. American Museum of Natural History exhibition. Mastotermitidae. Australian Biological Resources Study.